We’ve stayed in a fair few hostels in our time. In fact, various cheap and cheerful dorms and bunk beds became home for us during our year-long trip around the world. We met awesome new travel buddies from the bunk opposite, relaxed in laidback hostel lounges, and enjoyed many (perhaps too many!) beers in the lively bar downstairs. We do have a soft spot for a good social hostel, but as we’ve gotten older and our travel style has changed (running a business on the road will do that! ), we've found ourselves craving a little more peace, a bit more space, and a lot more privacy than we could normally find in a room full of random strangers. But while we've been retiring our hostel flip flops over the last few years, a new wave of hostel accommodation has been taking the world by storm. Inspired by the futuristic capsule dorms found everywhere in Japan, these capsules are like private bunks within a hostel room, and they promise a great night's sleep and oodles of privacy without taking away from the fun social vibe that we all know and love hostels for. Naturally, they've had us pretty curious. So when the legends at St Christopher’s Inns reached out to us to see if we were keen to try out their brandspankin’ new capsule hostel (the first of its kind for the U.K.! ), obviously we said yes. From the capsules themselves, to whether we got a good night’s sleep - here’s our review of our stay in London's first capsule hostel. St Christopher's is one of Europe's best-known and best-loved hostels, with locations dotted throughout the continent (Barcelona, Amsterdam, Paris, Berlin to name a few!). Modern, hipster, and super friendly, these are designed with fun-loving travellers in mind. The communal areas are bright and hipster, with cool little design elements (like a red telephone box in the reception area of the London hostel!). St Christopher's hostels are also generally located right in the centre of the cities they live in, which makes them the perfect base for getting your exploring on. Bringing people together is what St Christopher's is great at, and the (super friendly!) hostel staff organise plenty of pub crawls, London tours, and social events throughout the week to help you make new friends and explore the city in a fun way too. St Christopher’s Inn is known across Europe for being a ‘party’ hostel - though we didn’t find it particularly wild in the way you might expect from others across the region. 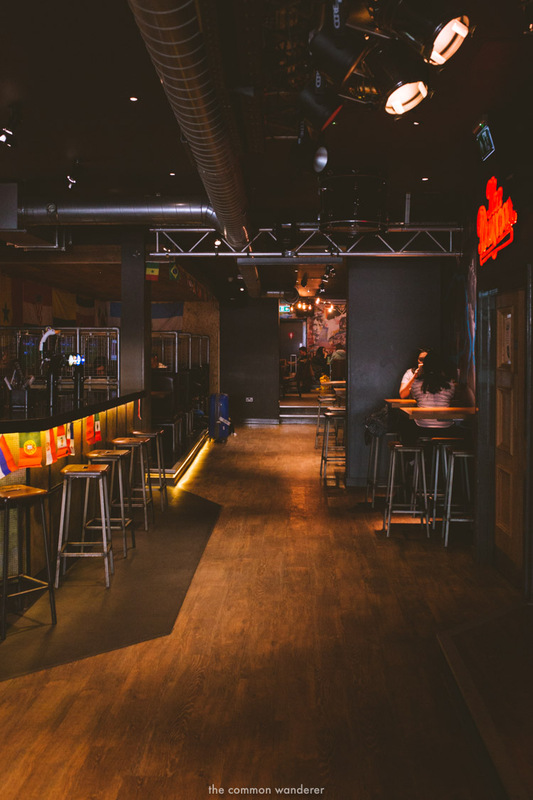 In fact, it’s just got a nice social buzz, particularly thanks to the downstairs bar, Belushi’s, that serves food and drinks until 1am. The crowd here can be an eclectic one. London Bridge has a heap of student halls and universities nearby, and with a pretty decent American-style menu and cheap drinks, it’s pretty popular with the younger, student crowd. But expect to also see lots of professionals ducking in for a quick bite after work, or sports fans glued to the many TV screens and cheering on their fave teams (this was especially true when we stayed, during the early stages of the World Cup!). All guests of the hostel receive 25% off food and drink at the bar, which is obviously a huge bonus for those travelling on a budget - and we can vouch that the food is pretty good! Stacked on top of each other in rows, the grey and white capsules looked hilariously like the washing machines at our local laundromat at first glance. But it turns out that behind the black-out curtains, a super comfy, tech-laden sleeping experience awaits. Each pod contains a bed, obviously, which felt SO much roomier than a normal dorm bunk, two charging ports with 2 extra USB slots (a dream for those, like us, trying to charge laptops, cameras, and dying phones all at once). There’s also mood lighting controlled via a colour dial which can be changed up to suit your preference, a ventilation box to keep the pods cool and fresh while you sleep, and free WiFi that works pretty fast in each pod. The capsules basically feel like a small private room within the dorm, which means things like the awkward days of the hostel bunk bed-changing shuffle, having to make small talk with an overly-chatty bunk mate, or being woken up by someone stumbling in and turning all the lights on at 3am are all but over. Basically, these pods are the dream hostel accommodation for the introverted-extroverts amongst us - like Mim - who enjoy being social and chatting with new people, but also crave the privacy and quiet of being able to hide away in your own space to recharge. There are also huge lockers for storing your large bags (bring a padlock, or you can rent one from the reception), a bathroom with two toilets and sinks/three showers/mirror standsand a small communal area by the window where you can sit and read, or hang out with your new hostel mates! We have to admit, when we first discovered that the capsule dorm contained 26 beds we baulked a little. Our limit for a good night's sleep in hostel dorm rooms has generally been capped at about the 10-12 range in the past, and we honestly couldn’t even imagine how many heavy snorers there’d be in a room full of 25 other people. But entering the capsule dorm that afternoon, we were immediately struck by just how calm and quiet it was. With the ability to shut the world out as soon as you’re safely in your pod, it absolutely didn’t feel as though that many people were in the room. This quiet remained the case after night fall too, which was a relief! That said, while our roommates might have kept the noise down, we do have to make mention of the fact that the dorm is located right above the bar - which does play thumping music till about 1am. You can hear/feel this through the bed - particularly the lower level - so if you're a light sleeper it's worth taking this into consideration when booking, and requesting an upper bunk. The hostel does also provide free earplugs at the front desk if you need. As for our own sleep, we were absolutely knackered after a week of travel prior, and we basically passed out cold for the night! *If you're not keen on sleeping in the capsules, the hostel also has normal dorms and private double rooms upstairs too. Capsules start at £19 in low season and £34 in high season, and include your pod, free continental breaky (toast, cereal, cheese and sliced meats) downstairs at the Dugout. Located right in the heart of London Bridge, the St Christopher's Village capsules really put you right in the midst of the London action. Most of the main attractions (London Eye, Westminster Abbey, Tower Bridge) are just a short stroll away, while the epic Borough Market is just across the street. The Jubilee and Northern lines both run through London Bridge tube station, which means you can get practically anywhere you want (including airports), with no fuss at all. With awesome accommodation in a great location already sorted, you can focus on what you're going to do when you finally arrive in London. Check out the day tours below for inspiration! Have you stayed in a capsule hostel yourself? What did you think? Share your stories in the comments below! Our capsule hostel stay was sponsored by St Christophers Village London Bridge, however as always, all opinions, thoughts, and ramblings are our own!